At first though, we should find out whether gold is a safe-haven or a hedge, and what is the difference between them? What is gold supposed to be a safe-haven or a hedge in relation to? Does it protect investors from a stock market crash, bond market volatility, inflation, or a systemic crisis? And finally, do the safe-haven properties of gold depend on the country and the time horizon? times, but not necessarily during turmoil. According to Baur and Lucey (2010), gold is a hedge and a safe-haven for stocks, but not for bonds. The authors also found that gold works as a safe-haven for only a limited time, around 15 trading days. This suggests that investors buy gold on days of extreme negative returns and sell it when market participants regain confidence, and volatility is lower. Baur and McDermott (2009), using data from 1979 to 2009, showed that gold is both a safe-haven and a hedge for major European equity markets and the US, but not for Australia, Canada, Japan or major emerging markets such as the BRIC countries (investors suffering losses in emerging stock markets turn to developed markets rather than to purchasing gold). Although most economists agree that gold is a safe-haven, Baur and Glover (2012) remind investors that the safe-haven features may change over time as gold gets more popular as an investment to protect against equity market. This is because investors who hold significant amounts of gold in their portfolios may be forced to sell some or all of these holdings in times of equity market stress when they face borrowing or liquidity constraints in other portfolio holdings. This is an interesting point, especially when gold prices initially fell after Lehman Brothers’ bankruptcy due to forced sales (see chart 1), but we believe that the perception of gold as a safe-haven against crashes in any particular asset market is too limited. Gold is an insurance against broader systemic tail risks. The economic function of insurance is not to generate huge profits during normal times, but rather to protect investors’ wealth against unlikely but serious events (like house fires). Similarly, from the fundamental point of view, gold is not purchased for yield when the economy functions well, but to protect wealth against tail risks (however, it is possible to reap decent profits from investing and trading in the yellow metal in all phases of the market cycle and the performance of signals from our Gold & Silver Trading Alerts proves it). From this perspective, it should be clear why gold has no yield. Has insurance any yield? No, actually you have to pay premiums for being insured. The same applies to gold. And what are tail risks? Technically, they arise when the possibility that an investment will move more than three standard deviations from the mean is greater than what is shown by a normal distribution. To simplify, there are very unlikely events which entail very serious consequences. The best example is the last financial crisis. 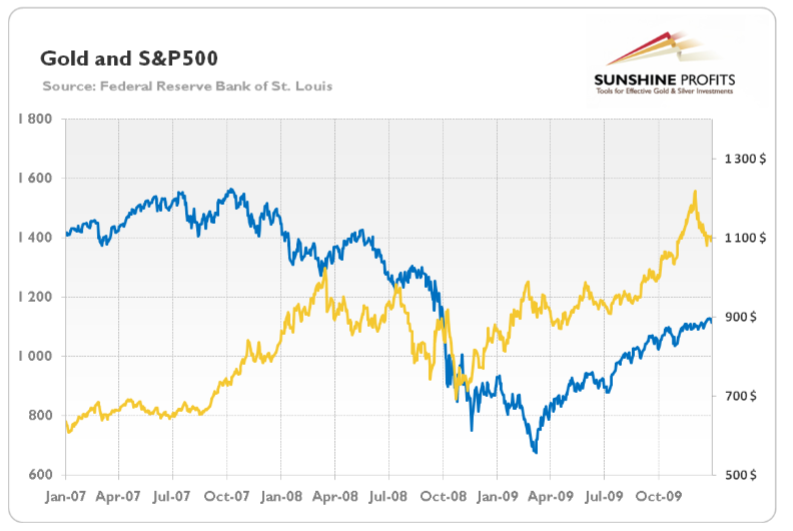 As you can see in the chart 1, stocks (and other standard financial assets) drastically fell after the Lehman bankruptcy and suffered huge losses in 2008, while gold ended that year with a modest gain. Why are there tail risks and why does gold protects against them? It is in the very nature of our inherently unstable monetary system with its fractional reserve banking system, paper currencies and excessive credit, which is based only on faith. Gold used to be money for thousands for years, whereas our fiat money experiment has been here only since 1971. Thus, when this faith decreases, especially in the U.S. dollar, the unofficial world currency, gold prices rises. Contrary to paper currencies, gold is a real commodity which cannot be printed and has a certain use value, which sets a bottom for its prices – this explains why there is demand for it in times of distrust in the U.S. dollar system. You can think of gold as an insurance or backup in case of the collapse of the fiat money economy with the greenback as the world reserve currency. That way, the price of gold reflects the tail risks connected to the unstable monetary system. Indeed, portfolios including gold tended to perform better during most financial stresses, according to the World Gold Council’s report. Gold prices were increasing during the 70s, the time of high inflation and uncertainty over the new global monetary system, and in the 2000s, when over-indebtedness in the U.S. shook trust in the dollar-dominated system. Contrarily, gold prices were falling in the 80s and the 90s, when Volcker renewed the trust in the greenback, and after September 2011, when the extraordinary measures of central banks restored the confidence and reduced the bidding for tail risk insurance. crises, but not necessarily in normal times of high confidence in the fundamentals of the economy. However, gold is not a safe-haven against any particular asset class; rather it is protection against systemic risks – an insurance against a current monetary system based on the fiat U.S. dollar.